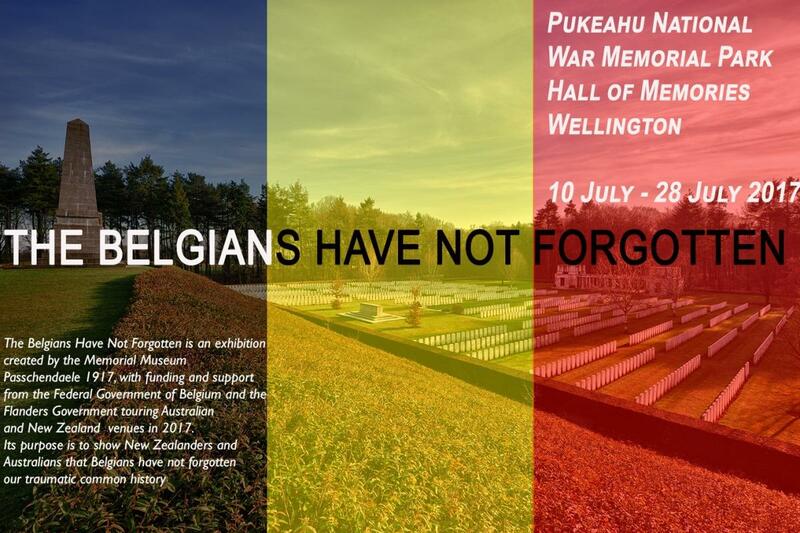 “Passchendaele: The Belgians have not forgotten” - an exhibition developed in Belgium to acknowledge New Zealand’s part in the Battle of Passchendaele opens for a three week period at the National War Memorial on Monday. “This year is the centenary of the battle in which over 840 New Zealanders were killed in one day trying to capture Bellevue Heights on the outskirts of the rural Belgian village of Passchendaele,” says Brodie Stubbs, Ministry for Culture and Heritage’s Manager, Heritage Projects. Promotional banner for The Belgians Have Not Forgotten. By the time they were withdrawn from Flanders, in February 1918, the New Zealand division had suffered more than 18,000 casualties, including around 5,000 deaths, and been awarded three Victoria Crosses for gallantry. “This is an excellent opportunity for New Zealanders to understand more about what happened at Passchendaele and see that our soldiers are still remembered in Belgium,” Mr Stubbs says. The exhibition covers New Zealanders in action in Flanders, the battlefields, and the journey New Zealand soldiers took from Gallipoli to Flanders, Messines, Passchendaele and Zonnebeke. The exhibition was created by the Memorial Museum Passchendaele 1917 (MMP1917) in Belgium and was funded and supported by the Federal Government of Belgium. Front of the exhibition inside the Hall of Memories. Steven Vandenbussche, Director of the MMP1917 said it was made to give families and fellow citizens of those who fought in Belgium a chance to understand what happened. A previous exhibition from MMP1917 toured New Zealand and Australia in 2009. Some of the display panels inside the exhibition. “Passchendaele: The Belgians have not forgotten” opens to the public on Monday 10 July 2017 at 10:00am and closes on Friday 28 July at 4:45 pm. It is free to visit. To arrange photos and media visits please contact Curator Paul Riley on paul.riley@mch.govt.nz or ph 385 2496. There is more information about Passchendaele and the NZ war experience in Flanders on Te Ara and NZ History.